This is a better deal than their earlier offering. Now including a move controller. Mine arrived today. I was about to ring very, as not had an email re: partial refund. Checked my account and the £40 had been credited. So as it was a new very account I managed to get this for £113.98. One very happy lady!! Thanks so much OP!!! Just the one move controller? Do they normally come in pairs or something? Sorry ignorant here just ordered for hubby for Xmas as it seemed pretty good! Thanks ordered. Got the Argos deal already but will return if all goes to plan! Do they normally come in pairs or something? Sorry ignorant here just …Do they normally come in pairs or something? Sorry ignorant here just ordered for hubby for Xmas as it seemed pretty good! Yes they come in pairs. Great deal. Can return my Argos order now..unless something better comes up lol. Why would it include a game which doesn’t use motion controls? I bought the John Lewis astrobot vr bundle on Friday for £169.99. Is this the same for £10 more but with move controllers? Anybody else pay by paypal and payment failed but showing as pending in paypal? Dont wanna rebuy in case get charged again. Great find - I’ve been fighting the urge to bite on one of these deals and told myself I wouldn’t unless it was sub£200 with move controllers - so I’m in too - thanks OP! Ordered! Thanks to OP, and also for the code for a tenner off which worked just fine. I assume this is the V2 version? Not even sure if any retailer still supplies the V1 version anymore?? Ha, if this is legit then what a bargain. I managed to get the Currys £210 deal but will take it back if this comes through, I have a suspicion its a mistake though and the move controllers were supposed to be optional like the other bundles. Will have to see if it gets cancelled. Well I just got this deal with the £10 off code. The John Lewis one can go back. Ordered but no controller included in description of my delivery item, and is coming ‘direct from manufacturer’. Just can’t be bothered with the hassle of returns so cancelled here. Good luck though! I ordered this. Now I'll have to refund my £170 order with Currys. Or maybe I should wait a bit and see if this deal is honoured? Good deal. Just order waiting for this to go below £200 with move controllers. If it’s a mistake then I will send it back. 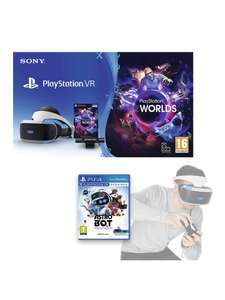 Best PSVR deal by far. Have some heat!